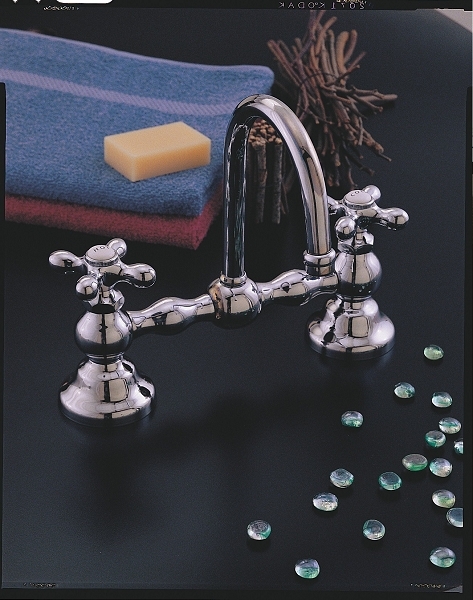 The Columbia Faucet Set with Gooseneck Spout has 4-spoke handles with porcelain 'Hot' and 'Cold' buttons. Measurement: 5-inch spout extension, 2 7/8-inch base diameter, and 5 1/2-inch height. It is available in 8- or 12-inch widths. Solid brass available in Chrome (as shown in photo), Polished Nickel, Lacquered Brass, Matte Nickel or Oil Rubbed Bronze finish.